Ronice Harrison is the CEO of Chelle Service Capital and the founder of ChelleCoin based in Canada. Ronice has a foundation in the banking industry and “7+ years of experience, as a Real Estate Investor and has successfully purchased and sold, both individually and in bulk in excess of 200 Million worth of residential and commercial properties”. In this interview, Ronice will be sharing with us, how ChelleCoin will be using Blockchain technology to create more opportunities in Real Estate investment. My name is Ronice Harrison; I was born in Toronto, Canada to two Jamaican parents. After starting my schooling in Canada was given the opportunity to complete my middle school and High School education in my parent’s native land of Jamaica. From Jamaica, I attended University in the United States of America, before returning to Canada at the end of my studies. Upon my return to Canada, I began a career in the banking industry, formed Chelle Service Capital in 2014 and opened the doors to the Chelle Mississauga location in April 2018. 2) What is Chelle Service Capital? 3) We believe very much in the “Evolution of Finance” what can you tell us about this concept and how much has it inspired your work at Chelle Service Capital? The average individual is usually limited in their understanding of finance. With the advent of the crypto market, the keys to the finance industry are falling more and more in the hands of the individual and moving away from the mainstay institutions of the past. With this trend, it has become clear that the next frontier of finance will be in constructing tools and products designed to help the ordinary individual enter the world of finance. This has become the focus of the firm, in that regard for us the evolution of finance does not just reflect our adaptation to the modernization of institutional investments. For us the evolution of finance also reflects our desire to be central in the growing industry of helping the common man enter this fast-paced and changing world. 4) Can you briefly describe Chelle Coin and what led to its creation? During the early years of Chelle Service Capital, we encountered severe cross border transactional friction when acquiring properties. As the firm grew, I was introduced to bitcoin and discovered its complete absence of transactional conflict. It wasn’t long before we realized there was an unserved market for payment processing services for spending large amounts of cryptocurrencies on real-world assets. Further, we discovered that through the use of smart contracts and non-fungible assets it would be possible for investors to create unique investment products and gain exposure to the world’s largest asset class in ways never before possible. 5) We want to know more about your Chelle Coin, how does it work and where can we find it? Chelle Coin a real estate token with unprecedented customization features, land title security, rental income generation and a payment service empowering people to purchase any property using their cryptoassets. The Chelle platform has two stages: The first stage is the ICO and investing stage. Investors contribute funds and get tokens. Using those funds, our Atlanta team will purchase multi-family residential properties. Investors allocate their tokens to the properties they choose to receive income from. Payouts are in our token, CHL or ETH. Our allocation process allows both customizable income streams or traditional, evenly diversified income streams. We believe in tokenizing investment products and enabling people to purchase property using crypto. I am confident you will find that our project showcases innovations unseen in traditional financial products, such as our customization feature. The second stage of our project allows people to use their crypto assets to buy real estate. Users give us crypto, and we put cash in escrow. CHL gives people a discount on the fee that will be charged for the payment processing service. We are currently in our public-ICO phase. , for that reason information on the coin is coming quickly and evolving daily. The best place to get more info on our project is by visiting our website at www.chellecoin.com or by joining our Chelle Coin Telegram chat. 6) What is on your roadmap for the next year? Our primary goal for next year is the completion of our ICO, and beginning the exciting task of purchasing properties using the raised funds and making money for our investors. We are also excited about our payment processing solution for dispensaries that we will begin rolling out at the end of 2018 and have a larger focus in 2019. We will also be working on our crypto wear clothing line along with our ICO listing site and much more. We are starting our public- ICO on the 17th of October, and it will continue until December 3rd. We will be using these funds, led by our Atlanta property management office, to purchase the first batch of properties with an estimated cumulative asset value of $50 million USD. The first batch of acquisitions will occur during the first quarter of 2019, after the completion of our ICO and the distribution of CHL ERC20 tokens. As the properties are purchased, rehabbed and prepared for tenants, the properties will be added to the Chelle platform’s property browser. Investors will be notified when a property is ready, and they can begin allocating tokens to that property to claim residual income and create their custom income stream, represented by a unique ERC721token. Once the income distribution is added to the investor’s ERC721 token, the investor’s ERC20 balances will be accrued in the ERC721 token and can be withdrawn at any time. The allocation of tokens, creation of ERC721 tokens and the distribution of residual income will be available platform features in Q2 2019. To improve user experience and access, a mobile app will be created to host these functions. This will be ready in the second half of 2019. 7) Where do you see Chelle Coin in five years and beyond? Our goal is for Chelle Coin to be the leading property acquisition cryptocurrency within the next five years. Our goal is to have just over 80% of the real estate market transactions in Canada and the US to be running through Chelle Coin. The applications of the technology will make properties purchased with Chelle Coin so competitively priced that we anticipate it being absorbed into North American real estate practices. This presence in the Canadian and American market will result in the slow but deliberate globalization of the Chelle Coin product. Today Chelle Coin is directly linked to Chelle Service Capital, moving forward and into the future the name Chelle Coin we believe will be directly linked with how real estate is transacted on a whole. By this time the CHL ERCR20 tokens will have been in circulation for a year, development of the property buying/selling feature will be complete. This feature allows users to buy and sell property using their crypto assets. Bitcoin, Ethereum, Litecoin, etc. are all available for this service. Users who choose to use CHL will have the same service but will save on the transaction fee for this service. This allows a user to buy any that is for sale in fiat. Users wishing to harness the savings CHL offers on crypto- property transactions will be able to purchase CHL on an exchange. By the end of 2020 we will have completed acquiring the final batch of properties bringing the estimated cumulative asset value to $250 million USD. 8) There are many cryptocurrencies with a focus on the real estate space, what differentiates Chelle Coin? 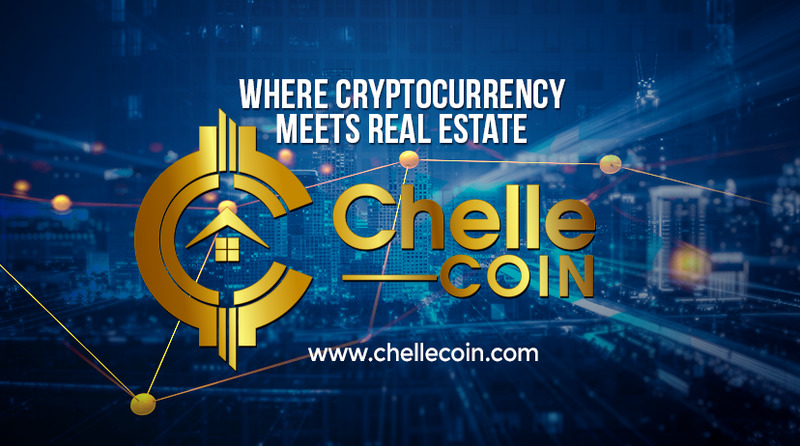 Chelle Coin is the only real estate coin backed by an established real estate firm that is able to promise financial return to its coin holders when the coin is invested in Chelle properties based on rental incomes. It is the only token product that enables fully customizable real estate income exposure and it has a utility function for the second stage of the project. This adjustment allows the coin to hold its value regardless of the real estate climate, revenues generated from both property value and rental income support the value of the coin. 9) What kinds of people are you targeting for Chelle Coin adoption? Any individual who is looking to be involved in the crypto market, the real estate market and anyone looking for a supplemental income opportunity are the right fit for Chelle Coin. 10) What do you think is preventing cryptocurrencies and tokens from being adopted on a mass scale? Security and clarity, the issue with crypto at this time is the perceived lack of security which is a direct result of the lack of information that exists for the average individual. As the flow of the detailed information around crypto is no longer as esoteric, then we will see a great security and activity with crypto on a mass scale. Keep a lookout on our website www.chelleservicecapital.com for more exciting news and endeavors from the Chelle team!